POLICE REFORM: You’re doing it wrong. Is violence still rampant in the country? Yes. Is homicide such a problem that it must be considered as an epidemic? Absolutely. So, what’s the central government doing about it? They tried their hand at a new attempt of police reform. The catch is that this one flew under the radar. Last month, Nicolas Maduro signed the Police Revolution Law as one of the fifty executive decrees he wrote, thanks to his Enabling Law powers. What’s revolutionary about this legislation? Not much. 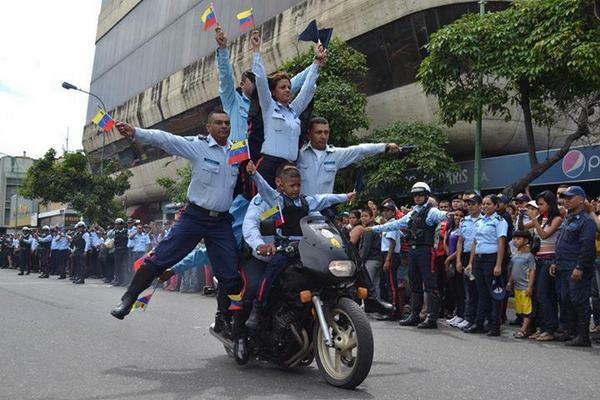 It gives full authoritah to the brand new Presidential Commission to Transform the Police System, with the former police officer/Western Caracas Mayor/ National Assembly Deputy Freddy Bernal at the helm. So far, this commission has taken over several local police forces, including the Libertador Municipality Police (PoliCaracas). This comes on the heels of the Robert Serra murder case, as two of its members have been charged. Another police force that could face deep changes is the Criminal Investigations Police (CICPC). A new scandal has put the CICPC on the defensive after some of its agents were caught protecting a criminal captured in Cabimas, Zulia State. Those changes could be seen as a political victory for the colectivos (pro-government armed groups) after the death of five of their members in a shoot-out back in October. Six CICPC members have been detained for this incident. The most curious announcement related to this “Police Revolution” plan was the creation of another police force: the Anti-Corruption National Corps, whose actions will be considered “top secret”. It will now join other security forces created this year, like the Special Protection and Security Unit of State Personalities, the Special Brigade Against Violence-Generating Groups and the Clash Force. Because you can never have too many police forces. Or cooks. This new police reform plan distances itself from predecessors few people remember (CONAREPOL? A Toda Vida?) in the lack of promotion among the public. Perhaps the economic woes that the nation is facing makes it difficult to put effort into explaining these measures. But maybe this is all for the better, as few believe they would have any impact on crime in the short and/or long term. Next articleHow will our women help solve our conflict?